Simplify and improve the digital and legacy records tracking process. Versatile Professional helps you complete the records management puzzle. It has everything you need to maintain confidence in your records management program. Your goals are our top priority, so we designed a program that’s intuitive, secure, and reliable. your virtual records management toolbox. Whether your files are still in use and need to be accessed regularly (“active”) or stored in boxes and put away for eventual disposition (“inactive”), Versatile Professional helps you track their location at all times. With Professional, records can be associated to departments and assigned to a robust file classification. Print labels for your files, boxes, and locations. You can include any data field, including user-defined fields and barcodes. You can also create custom color-coded label designs for files or boxes based on data from your Versatile database—without the need to buy expensive third-party software. Keep your whole team up-to-date on the state of your records without granting each person full access to your system. Define who can access functionality by each person’s role. Organize destructions into individual batches of records (boxes and/or files) to be destroyed as a whole. When the time comes to destroy records that have completed their lifecycle, simply process the batch. Versatile Professional contains a convenient built-in imaging system that allows you to attach electronic files, such as PDF and Word documents, to a file or box. You can even scan images or load from a network or PC. Checkout Manager performs records request handling, tracks the circulation of your files and boxes, handles check out requests, and allows you to generate and email “overdue” reports. Locate records easily with Versatile Professional’s space management feature, which displays a virtual records center with configurable aisles, bays, and shelves. Don’t travel to your storage room to see where your records are! Schedule records for physical transfer or destruction and dynamically calculate retention. Simply assign your record series to a file or box, and the system automatically calculates the transfer and destruction dates. Not every person in your organization needs access to the full Versatile application, but many might need to request access to certain records. With Versatile Web, requesting access is easy and can be done anywhere. When you add Versatile Web to Professional, for example, you can search boxes and files, as well as view corporate retention schedules. You can then send an electronic checkout request to the records center. Versatile Web places records and retention information within everyone’s reach, with minimal training. Keep your records within reach with the Versatile Records On-The-Go app. Versatile Records On-The-Go connects wirelessly to your enterprise’s current Versatile™ technology solution, allowing users to view the status of records in real-time. 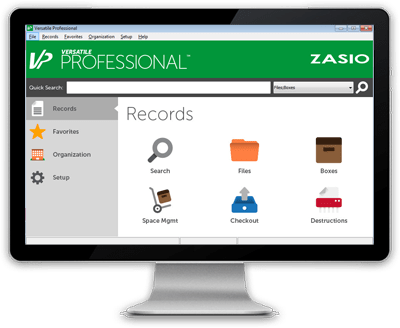 Its compatibility with Zasio’s premium technology solutions creates a seamless, end-to-end records management program for your enterprise. The Versatile Records-On-The-Go app also pairs with Bluetooth RFID or barcode readers to store, check-out/in, lookup and locate records from your phone. Looking for something more robust? Our other records and information management solutions might be what you’re looking for. Enterprise is designed to meet the records management needs and the information governance challenges of mid- to large-sized businesses. Enterprise has support for complex record structures and a customized user experience. Enterprise is also available in Legal Edition (LE).